The term ‘automatic’ is the order of the present day with people attempting all procedures that can be performed all by itself without needing any assistance. If we observe the older trends, every activity performed, whether personal or professional involved human effort, whether it was any recreational activity or professional processes, it required human labor to the fullest. However, the computer systems and digital technology has led us producing things that are automated and involve minimal assistance or effort, offering both positive and negative connotations. But activities like switching on these machines and accessing the varied software still involves human effort and to reduce this effort Lomsel Shutdown 1.02 has been developed that enables performing of routine computer related activities mechanically without any hassles. 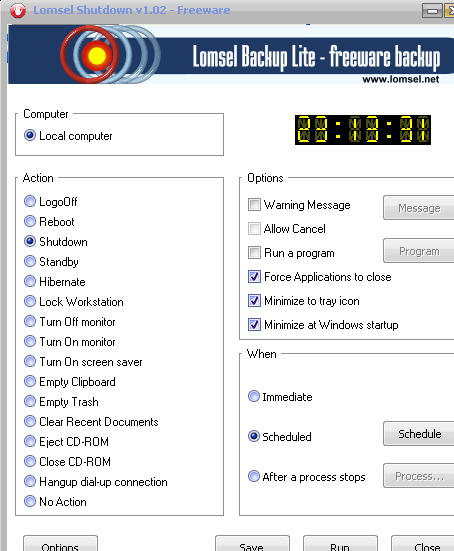 Lomsel Shutdown opens with a compact looking and neatly arranged interface with the main options placed at the right pane and main actions list located at the left side. The user can set a time for these activities as per the three options available which include immediate, scheduled and after a specific process stops. This small system utility caters to performing a variety of functions automatically like shutdown, restart, hibernating workstations and disconnecting the current dial up connection amongst many others. The program also provides simple access to these operations through the system tray icon that has a pop-up menu. The features and actions that can be performed also include logging off, locking the system, standby, turning off the PC monitor; empty the trash bin, clearing recent documents, turning on the screen saver and various mouse actions as well. To sum up, Lomsel Shutdown 1.02 absolutely provides ample scope for easing out normal functionalities and reducing any effort on same; however doesn’t gain many ratings owing to a seemingly non-productive usage and hence gets 3.5 points.